KAYAC recommends employees to live and work in Kamakura. KAYAC partially pays the rent for employees who live in Kamakura, Zushi, and other places close to the development location. KAYAC runs a real estate company called Realkamakuraestate. Through this, KAYAC offers discount on agent commission for employees who are moving to Kamakura area. * To see this from a slightly different angle, please also visit a page explaining the reason why we selected Kamakura for our head office location. For those working in Kamakura, companies and organizations based in Kamakura jointly operate "Our Town Cafeteria". "Our Town Preschool Kamakura" is a regional nursery school for those working in and living in Kamakura. All employees of KAYAC are members of the HR Department and create an organization that is fun to work in by being involved in hiring, evaluation and wage reviews. The business cards of everyone at KAYAC state that they are members of the “HR Department.” It has been proven that this alone is enough to heighten employees’ awareness of hiring. Finding people you want to work with for your own good. We would like to make the company create a cycle like this. All employees provide each other with suggestions and advice to ensure the growth of employees. A newly graduated recruit making suggestions to the CEO is not unheard of. These are also published throughout the Company. Employees in the same occupation conduct mutual voting once every six months to determine pay increases relative to their ranking. The specific amounts of compensation for each employee are not shown, but the ranking is published￼. The compensation for KAYAC employees is determined by three elements: luck, mutual evaluation by employees, and evaluation by supervisors. These are quantified in extremely simple manner. Wages are determined by the roll of a dice every month! This is a system in which all employees roll a dice before payday to receive “basic wage + (number on the dice) %” as an additional payment. It is difficult to create a perfectly fair evaluation system as long as people are evaluating other people. This system was based on the idea that it should be acceptable to have an element determined by god instead of other people. Fixed monthly wages are determined by ability! They are revised once every six months. People in the same occupation determine the ranking through mutual voting, and the results are reflected in monthly wages. In response to the simple command for “everyone to establish the order of compensation as if you were the company’s president,” the results of voting by employees are tallied. The wording “as if you were the company’s president” means that they are allowed to be subjective. This is based on the philosophy that a collection of subjective views is surprisingly accurate, and that a collection of subjective views is the view most valued by the organization and is the most convincing and fair. A mutual sharing workshop based on a "company president's perspective"
Mutual evaluation based on the monthly wage ranking is key to maintain our culture at KAYAC, however, as the number of employees increase, evaluation standards tend to diversify. Through this workshop, we aim for mutual understanding of what each employee values, ​​and to increase new perspectives. This is determined four times every year based on the subjective view of producers. Each quarter, bonus resources are allocated to producers (business supervisors) according to the performance of each business. Each producer allocates bonuses to employees according to their contribution to the business. Whereas the above ranking of ability is determined based on the subjective views of all employees, allocation within each project is determined solely at the discretion of a single producer. To sum up the above compensation system, it is a balanced design with three elements in which the element determined by god accounts for several percent, ability-based compensation is based on fair evaluation of employees by each other, and bonuses are determined at the discretion of producers, which may result in unreasonable evaluation. Zero yen “Smile Pay”. Priceless. Smile Pay is a monthly program to find something positive about other employees and send a witty comment to each other. This is an extra compensation system that makes it fun to open up your pay slip. We got the idea from “Smile 0 Yen” of a franchise chain. Along with Smile Pay, we have a Punch message to tell employees what they should fix. KAYAC aims to have employees with unique strengths, so it is difficult to provide training that helps specific skills shared by everyone. For this reason, we place emphasis on mechanisms providing opportunities for each creator to grow. Prospective employees conduct brainstorming with employees with similar careers before they decide whether or not to join KAYAC. The theme of the brainstorming is what kind of growth opportunities are present within the company based on what the prospective employees want to do. The purpose is to enable prospective employees to see more “things that can be achieved at KAYAC” by hearing the opinions of employees already working at the company. Based on this, we want to make the company a better place. Brainstorming finally conducted with people retiring is also aimed at maintaining good relations with people who are leaving. Once every six months, employees receive feedback on their own activities from employees who worked with them, reflecting on their own activities over the past six months. The objective is growth and it is not linked to compensation. It is characterized by the reflections of other employees and the fact that all feedback regarding this is published. For example, newly hired employees and management executives can see how they give each other suggestions and how they reflect upon their own actions, and even newly graduated hires can give feedback to the CEO. Ishikoroboshi (Pebble Hat) is a secret item that Doraemon has. When you wear it, you are treated as a stone pebble that nobody pays attention to. We wear ishikoroboshi and walk around the office to see how other employees work. By doing so, we can get an idea about how we should work. Of course, it is okay to enter a meeting room where a meeting or interview is taking place. We feel somewhat awkward at first, but in the end, we feel glad we did it. This is a system in which a junior employee accompanies the CEO when he goes on a business trip to make a presentation or conduct recruiting activities. They also conduct interviews together. This enables employees to learn what the company wants and how to assess people. Dialogue during travel also lets employees absorb the CEO’s way of thinking and also present their own ideas to him. In this way, the initiative is aimed at developing the next generation to support KAYAC. * Note that the CEO actually carries his own bags. Opportunities for growth are found in the “career interviews by everyone” and personnel are assigned to projects matching such opportunities. The results are examined in “360-degree full open feedback” and at the same time, everyone evaluates their ability to reflect it in compensation in the monthly wage rankings. This cycle is referred to as the “creator assignment system.” This is the embodiment of the overall image of KAYAC’s HR system. There is also an indicator of how KAYAC is not just an enterprise, but rather a “fun-loving” enterprise. Each employee grades whether they are having fun working on a scale of 1 to 10. Even if this fun indicator is low, it does not reflect poorly on the evaluation of the employee. However, it does effect the evaluation of the employee’s supervisors (producer and occupation leader). Considering that a fun-loving corporation is a company where employees have fun working, this indicator could be seen as an indicator of the management of a fun-loving corporation. This was made with the intent to ensure that this fun indicator is maintained in management when making new companies as long as they are part of the group of fun-loving corporations. This is because satisfaction results in people wanting the status quo and this does not match KAYAC’s promotion of change. Instead, the above question is asked once every six months. Employees are asked the reasons why that cannot recommend their own company. Reasons for not being able to recommend it vary depending on the person’s circumstances, but we believe it leads to steps being taken to improve the company. We will make the company a place where people want to increase the people they work with. The question was created by applying the approach of NPS for measuring customer loyalty. KAYAC issues card called “Fast Passes” and distributes them among all employees. All employees belong to the HR department, so by handing out this Fast Pass to a person who they want to work with, the recipient is exempted from initial screening. Also certain employees with interview experience have a “Last Pass” for inviting candidates straight to a final interview. Have an internet. Work from anywhere. Headquartered in Kamakura, KAYAC believes that people can work anywhere if they are given Internet access and a PC. At times, everyone follows each other’s work while working somewhere different than usual. There are conditions on participation, but some people have worked overseas for more than a month. For example, temporary KAYAC offices have been established not only throughout Japan but all over the world in locations such as Hawaii, Italy, Vietnam, Izu, Okinawa and Shikoku. Incidentally, an office was established in Sendai for three months immediately after the Tohoku earthquake in 2011 for the purpose of providing disaster relief. There are also efforts aimed at free work styles. The department is “Room 873” directly under control of CEO Daisuke Yanasawa. It is a position granted more freedom than a normal producer, enabling a work style that is close to an entrepreneur within the company. The system is recommended for people like this. ・People outside the company who already have their own business, and would like to borrow the KAYAC brand or the abilities of KAYAC’s creators to grow their business as much as they can. ・People within the company who want to start a new business within the company or want to freely lead a business on a contingency fee basis even if it means bearing risk. Fight until the ‘color timer’ is up! Sprint over marathon. This work system was created based on the concept that there should be various work styles according to changes in the stages of a person’s life. It is a system for people who want to concentrate on work at specific times. It also enables people to choose work styles that suit them, such as mothers and homemakers who have preferences about the times and days they are able to work. There is an increasing number of employees who work until 4pm or have three holidays each week to spend time on their own hobbies. The company also welcomes work styles such as these. There is also a club called the “Flex Club” where employees using this work system gather together, enabling them to consult each other about a variety of things. Employees can take a day off in the month they were born. It should be spent by being grateful for being born. Numerous experimental works created by KAYAC employees at work and on their days off are on display for everyone to see! The trial production lab is a collection of numerous experimental works created by people at KAYAC who love creating. There are lots of items that meet all three criteria. There is also a company event called “Tsukutte-iitomo” held every month to announce things individuals have created, and anyone can participate. KAYAC employees have the manga business card using their own faces as a motif. These highly original the manga business card give the recipients surprise and enjoyment, and include a message recognizing the individuality of each person. Even a business card is a KAYAC work of art. We also offer support for people we want to work with even after they have left KAYAC! KAYAC sees change as being positive, and doesn’t believe everyone should continue working at KAYAC. Leaving the company to move onto the next stage is by no means a bad thing. Lots of creators originally from KAYAC being out in the world is also linked to the philosophy of “Create more creators.” We have a list of people who have retired to give them our support. Just earnest thinking of company’s future. Twice a year we organize a company-wide two-day camp, when everyone – engineers, designers, directors, – literally everyone stops working and head to camping facility. We break up into teams to brainstorm and share ideas about KAYAC’s systems and future vision. At the end of the camp, each team gives a presentation and the winning team receives a double bonus through Dice Pay. A philosophy emphasized by KAYAC is that it is hard to constantly think during day-to-day work. The camp is a place where employees can seriously re-examine things twice a year. Failures and successes in work along with other profound episodes are collected from all employees to accumulate content on the company Intranet. People joining KAYAC read these episodes to learn about what kind of company KAYAC is. Several of the blog entries are selected to be converted into manga every year. An original certification examination measuring the level of understanding of KAYAC’s philosophy, guidelines for action and culture. The test is usually conducted after joining the company and some time passes, and also during mid-term evaluation weeks. * The test was made possible with great facilitation assistance from e-communications Inc.
KAYAC awards are presented once every six months. They are given to teams and people who have worked hard over the past six months. A newsletter to each person KAYAC employees care about. The KAZOC (KAYAC family) newsletter is periodically sent to employees’ families, loved ones and friends to communicate what is currently happening in the fun-loving corporation. We also deliver “Smile Pay” from each employee as a token of gratitude. This is a newsletter addressed to fun-loving shareholders. It contains not only basic information such as financial highlights and descriptions of businesses, but also brief descriptions of the company by KAYAC employees and other information that provides a deeper understanding of KAYAC. It is delivered to the homes of shareholders once every year. Since KAYAC stopped using paper New Year’s cards in 2006, the company has offered New Year’s greetings on January 1 using Web content and mobile content devised by KAYAC employees. To ensure everyone enjoys the start of the year, the company breaks up into teams at the end of the year to conduct brainstorming and start creating. It is a big event in which an award is given to the team that provides the most fun. No idea is held back even if just for a day! April Fools' Day is an event that really shows off the ideas that make KAYAC worthy of the fun-loving corporation title. The gloves come off as people pit their ideas against each other’s. We will show you some of the best surprises and the best lies. 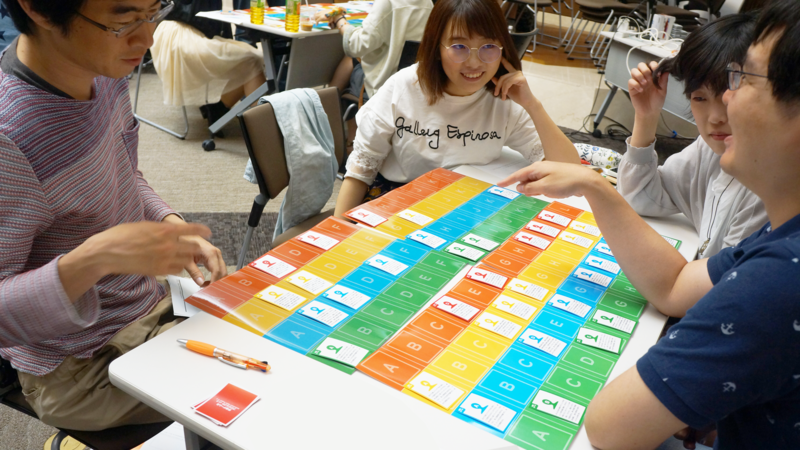 There are also fun events like “Sabure Dice Pay” where participants receive the same number of Hato Sabure shortbreads as the number the roll on a dice, and the “Office Tour” taken with employees. Awards for unique welcome parties! A contest for clubs and student groups nationwide to compete with plans to welcome new students that are the most fun and ingenious. Making all sorts of plans to attract people to a club is like recruiting or attracting customers in a company. If a different approach than the usual university life is taken, this can provide skills and experience that can be used in the future. That is why we hold this contest. Career fairs are usually held jointly by several companies, but KAYAC holds this event alone. It is a career fair held once every year with many booths run by unique KAYAC employees such as a man in the Guinness Book of Records and creators active in a multitude of areas. There are also loads of exhibits such as a Retiree’s Booth, a Final Interview Booth that gives job offers on the spot, and a KAYAC Work Exhibition displaying the content of work.